Durham, NH – Business Wire – June 18th, 2009 – Intellitech Corporation, www.intellitech.com, the leader in lowering electronic product costs through IEEE 1149.1/JTAG announced its patented FlashJETT Programming Board (FPB) for concurrent programming of NOR, NAND and on-chip non-volatile memories. The FlashJETT provides one hundred high-speed I/O pins which are configurable to support I2C, SPI, JTAG, NOR, NAND and microcontroller specific protocols at speeds in excess of 50Mhz. Unlike traditional pin electronics which originate inside the in-circuit tester, the FlashJETT sits inside a pogo-pin fixture close to the target in order to maximize the operating frequency. A single FlashJETT can target multiple protocols for instance programming a NOR flash, an SPI flash and a JTAG CPLD, limited only by the number of I/O pins required by the target. Multiple FlashJETTs can be connected to support concurrent programming of sixteen or more targets at the same time. Why not use JTAG for on-board programming? 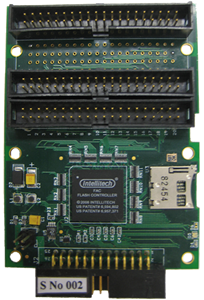 There are times when it is not possible to perform on-board programming through JTAG. A micro-controller with on-chip Flash may not support JTAG. A processor vendor may not release details on how JTAG emulation is performed preventing processor assisted downloads to external Flash using JTAG. The JTAG access to the IC internals maybe locked for security reasons leaving only EXTEST based Flash programming available which is too slow for volume production. FlashJETT fills the gap where direct physical access is needed, fast programming times are required or both. "We’re using Intellitech’s PT100Pro with FlashJETT in our production to program two different microcontrollers on four PCBs at a time" said Mr. Nagabhushana Shastry, Manager of SMT at Continental Automotive Components. "It is no longer business as usual in the auto industry. We must use new solutions which provide the most value for our budget. Intellitech’s FlashJETT solution enables us to achieve production line throughput while simultaneously meeting our cost objectives" he added. A recent customer trial benchmarked Intellitech’s PT100Pro with FlashJETT blank checking, programming and verifying a Spansion S29AL008D device in 5.5 seconds versus an Agilent i3070 which took nine seconds. The Agilent ICT tops out at just programming two devices at a time where the PT100Pro with FlashJETT can program sixteen devices at a time. The FlashJETT throughput is one device every 0.34 seconds versus the i3070’s one device every 4.5 seconds, yielding a greater than 1000% improvement in throughput. FlashJETT is available now and priced at $495.00. Intellitech is a registered trademark of Intellitech Corporation in the United States, India, China and European Union. Agilent is a registered trademark of Agilent Technologies.